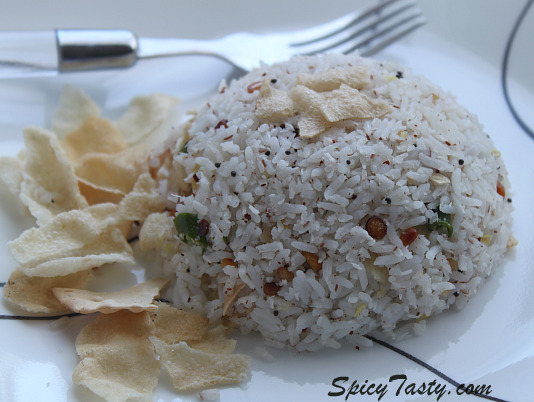 Coconut rice is one of the easiest variety rice dish in South Indian recipes. Especially it’s an most famous lunch box dish. 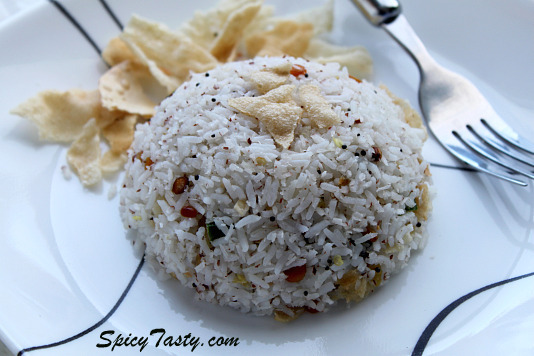 I love all types of variety rices like lemon rice, tamarind rice, tomato rice and coconut rice. When we got married, my husband and I discovered that we had varied taste in food. But we found ourselves agreeing on one dish – “coconut rice”. So sentimentally it’s our favorite dish 🙂 . It is so easy to make when you are out of vegetables in your kitchen and wondering what to make for lunch/dinner today. Eat with some potato fry trust me it tastes too good. Heat oil in a pan, add mustard seeds and after it sputters add urad dal and chana dal. When it turns light brown add ginger, curry leaves and green chilies. Fry them for a minute and then add shredded coconut. Just let it sit in the heat for few minutes (2-3 minutes). Then remove from heat and add the mixture into the cooked rice. Mix it well. Fry the papad in oil or microwave it and crush them into pieces. Mix them into them coconut rice. Serve it hot with some pickle and papad. Looks tempting. Can you explain what “Urad dal ” is? I assume I’ll have to check in Asian supermarkets for this…unless it’s more commonly know as something else in North America? Thanks for your nice comment. The urad dal is called “Black Gram” and I don’t think you’ll find it in normal market. You gotta check that in Asian Supermarkets only. Thanks for your comments tina, swathi and Malar gandhi. This rice looks so good! Do you use unsweetened or sweetened coconut in the recipe? Unsweetened is actually a bit hard to find in U.S. grocery stores. I’ve found it at health food stores.